University of North Georgia’s Convocation Center is a $40 million multipurpose facility that hosts a variety of events. The new 103,000-square-foot facility opened in February 2018 for a UNG Athletics basketball doubleheader. The official Ribbon Cutting Ceremony was held in May 2018. Located on the southwest side of the Dahlonega Campus at 180 Alumni Drive, the facility is a focal point of the university and campus life. It will also make a huge impact on the region in north Georgia. 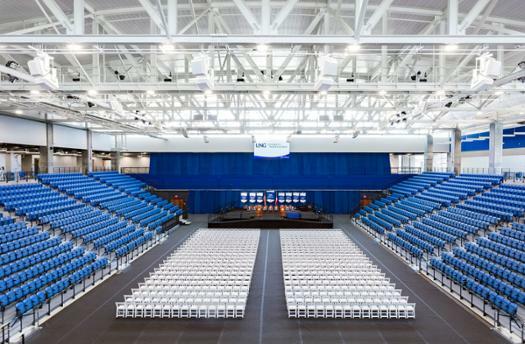 The Convocation Center serves multiple uses, with classrooms and labs for academic courses and physical training exercises, and ample space for large university events such as commencement ceremonies, athletic events, concerts and meetings. The center will also host community and regional events, such as job fairs, tournaments and large-scale meetings. The 3,600 seat arena provides the opportunity for many diversified events. As the center for social, academic and athletic events on campus, the Convocation Center is the single venue that brings the university community together at one place and one time to share an experience: the very definition of community. Contact Wanda Martin at (706) 864-1643 or visit Hoag Student Center 314.